With more than 350 languages spoken in the United States, many children grow up speaking two different languages. Children raised learning dual languages face unique challenges, but they likewise benefit from certain special advantages, ones that far outweigh the disadvantages of learning more than one language. Let’s analyze some common disadvantages and misconceptions surrounding bilingualism upbringing. Language mixing, or code-switching, is common among bilingual children. This arises naturally when children are exposed to two languages, as they may find it easier to supplement the less dominant language with a word or phrase from the more dominant language. This is common among bilingual adults as well, resulting in hybrid vocabularies like Spanglish. However, studies show that children do eventually overcome this habit, only truly mixing languages when amongst fellow speakers of their hybrid languages. Studies show that bilingual children often initially have smaller vocabularies than their monolingual peers at very young ages. One theory is that parents will, at times, mix languages when speaking to their children, using whichever language they feel might be easier for the child to understand. However, this inequity becomes rectified as the child learns to speak both languages more fluently. It is believed that some bilingual children may begin speaking later in life as opposed to children raised with only one language. However, this belief is based on parents’ accounts rather than a certified expert. There is no study to actually prove that children raised with two or more languages have any appreciable delay in language learning than their peers. 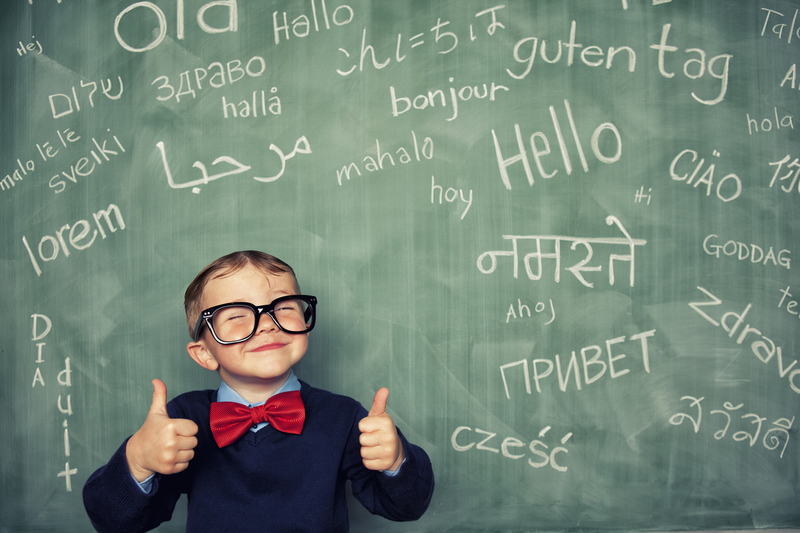 According to almost every study, growing up bilingual is a great advantage to any child, with benefits in cognitive ability, empathy, and age-related dementia later in life, to name a few. The first test to support the advantages of bilingual upbringing is the Stroop Test. Conductors of the Stroop test ask subjects to observe a written word that spells out a certain color that is, however, written in a different color. For example; Green. The subject is then tasked with identifying the color of the ink rather than the word itself. This elicits a lag in response, as the subject battles between the process for identifying the color and the process for identifying the word. The response time for bilingual subjects was demonstrably shorter than for monolingual subjects, demonstrating an elevated ability to handle multiple brain processes at once, and therefore greater problem-solving ability. Research experts also suggest that multilingual children may be quicker to demonstrate social empathy than monolingual children. It’s also postulated that bilinguals will develop age-related dementia four-and-a-half years later than monolinguals, and Alzheimer’s five-and-a-half years later. Just as those who exercise regularly are less likely to develop heart disease or diabetes later in life, those who exercise their brains, be it through puzzles or maintaining a fluency in multiple languages, are likely to develop dementia later than those who don’t. Children are always considered the most resilient of us, so it’s no surprise they’re able to process multiple languages over the course of their upbringing. Despite any temporary disadvantage they may experience while learning more than one language, the pros will always outweigh the cons, not only in the points mentioned above but later on in life, but when applying for prestigious careers, meeting intellectual peers, and contributing to society, in general. By raising children in a multi-faceted environment, we help extend cultural branches that will better unify our communities and spread more cultural awareness.